The John Crane 5610 Series is a modular cartridge seal family that includes interchangeable elastomer bellows, metal bellows, and elastomer O-ring pusher seal designs. A common seal head/mating ring set, utilized throughout all versions, is reversible to allow rotating seat/mating ring or rotating seal head operation, and is interchangeable with metal bellow seal heads. 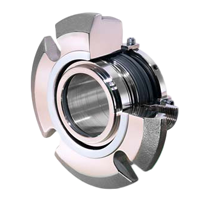 The seal has an optional quench gland (5610Q) with carbon ring throttle bushing. Many features and benefits include having a speed up to 5000 fpm/25 m/s, temperatures to -20º F to 400º F, and pressures up to 3.000″/75mm: 300 psi(g)/21 bar(g) max. It has a non-clogging wave spring outside the product.